It was time for a little get away, so Connie and I spend the last half of July and the first half of August on the garden Island of Kauai, the western most major island in the Hawaiian chain. I have come to the conclusion that if God does not actually live in Hawaii, He certainly vacations there! By far the most enjoyable part of Kauai are the locals. The are very open, warm people with a great sense of humor and a real bond to the earth. We could all take a lesson from them. This is the condo that we rented in Princeville, Kauai. The condo is located on a point on the far northern side of the island. It faces west. We had the top condo on the left. It is actually a two story condo with two large bedrooms about 1100 square feet of living space. There are about 1500 houses and condos in the town. It is very diverse mixture of vacationers, snowbirds and year round homeowners. The state of Hawaii has recently passed legislation that allows a deed for land to be divided into a maximum of 6 owners. This allows timeshare type ownership of any virtually property. Nice for the real estate agents but tough on the local homeowners that find themselves suddenly living next to a time-share vacation house. Sunsets were spectacular every night. This is the view from the balcony of the condo. Yes...life was rough! Most areas of Kauai would quality as a semi-tamed jungle. Since Kauai is volcanic in origin, it is very mountainous. The mountains capture the clouds and cause rain in the higher elevations almost every day. Therefore, there are waterfalls....everywhere. This is Wialua Falls just north of the main city of Lihue [pronounced: Li-hooy']. This 80 foot waterfalls is one of the most accessible falls in Kauai. It is also the waterfalls that was used as the backdrop in the movie, Six Days and Seven Nights and was seen in the opening credits of Fantasy Island. Because of the remote jungle locations available on Kauai, it is highly sought after for movie locations. Jason and Jamie at Spouting Horn near Poipu. The volcanic nature of the island caused the formation of "lava tubes" that run inland from the ocean. These tubes were formed when lava flowed in a narrow channel from a central volcanic vent somewhere inland. The top of the channel became narrowed from cooling lava and eventually closed over leaving the lava to flow in down to the sea in what is now a tube. When the flow stopped, it would sometimes empty out of the tube and leave a hollow conduit.....often large enough to drive a semi truck through! In this case, the lava tube outlet is covered by the sea water and there is a small hole in the top of the tube a hundred feet or so inland from the sea. When the waves crash into the mouth of the tube, they cause high pressure up the length of the tube, and water sprays out the hole in the top of the tube. The gushing, horn-like sound, gives this place its name of "Spouting Horn". This is Opeaka'a falls, Just East of Kapa'a.. It is not directly accessible but there is a nice outlook from a park located across the valley from the falls. There is parking lot for the overlook of these falls. There is a sign on the fence that says, "FALLS" with an arrow that points away from the actual falls. Visitors drive up, look at the sign and then look the wrong way....searching for the falls. Must be a local joke. Connie's favorite waterfalls is the Queen's Falls located inside the town of Princeville, about 100ft from our rental condo. It is quite a hike to get down to them but the view is spectacular. She made me stand under the falls with her while a friend took our picture. Something in the water kept nibbling at my toes. This just goes to show that when a human gets into the water, he is no longer at the top of the food chain! These magnificent Bird of Paradise plants seem to grow everywhere in Kauai. This one was at the end of the walk just outside our condo. Connie had me on Flower Photo Patrol all of the time we were in Hawaii. On the south-west side of Kauai are the Waimea [pronounced, Wy-May'-a] canyons. The erosion that caused these canyons is much like that which cause the Grand Canyons in Colorado. Thus the Waimea canyons are often referred to as the "Grand Canyons of the Pacific". This photo was taken through a 300mm lens and the falls were about 3.5 miles away from us. You can see how the wind catches the falling water and pushes it away from the canyon wall. In the Waimea valley there are lots of locals making crafts. This guy would strip a few leaves off of a palm tree and start making baskets out of them. He couldn't make them fast enough. When the leaves dry, the baskets become stiff and durable. This is really becoming a lost craft that may have to be re-discovered by future generations of Hawaiians. Moonrise at Poipu beach. Poipu is a family beach on the South-West side of Kauai that has a natural breakwater. It keeps the rough waves out of the beach area and make it great for kids. The sunrises in Hawaii are just as spectacular as the sunsets. This is sunrise from the beach north of Kapa'a. This round of photo imagery was followed by breakfast at Eggberts restaurant at the Coconut center in Kapa'a. Yum!. Middle son Tyler relaxing on the deck of the condo. He is trying to figure how he can get dad to freshen his drink so that he won't have to move. One thing about a volcanic island is that, unless there is a beach, the ocean depth drops off fast. This makes for deep water and even deeper blue oceans. There is no word to describe the color of blue when the sun strikes deep ocean water from directly overhead. This is part of Kilauea point. It is a natural habitat for red-footed boobies, the Laysan albatross. There are literally thousands of them covering the hillsides of the point. Youngest son, Aaron at the lighthouse at Kilauea point. About ten minutes before this picture was taken, a rain squall had come through. You sure can't tell it by looking at the skies, though. This is me on Flower Photo Patrol again. I'm not sure what this flower is, but Connie wanted a picture of it. If you know what this flower, is, please drop me an e-mail with the description. We spent three days on Oahu before making the trip over to Kauai. Our hotel was located at Barber's Point on the South-West side of the island. The beaches here are all man-made and sculpted to perfection. This is the northernmost of four identical beaches along this part of the coastline. You can see by the cranes in the background that the hotels/condos are going up en-mass. This is about as relaxed as I can get. Reading a local paper while having breakfast on a balcony that overlooks a magnificent island beach. If life gets any better, I can't imagine it! Kauai has some of the world's most beautiful golf courses. Not only because of the layout of the holes, but because of the scenery. My two younger sons and I played golf on the Princeville course one afternoon. Connie went along to keep us honest. The golf pro at the clubhouse said that we should figure on taking 24 balls per golfer on this course. "Come on", I though. I've played tough courses before, but have never lost 24 balls on one. The three of us lost 30 balls on the first 14 holes! Since that's all of the balls that we had, that's were we quit for the day! Here is our middle son, Tyler, measuring a putt. "What the hell is a Puka Dog", you ask? Well, puka is Hawaiian for "hole". They bake a regular hotdog bun but they don't slice it. They use a hot poker to punch a hole in the end of the bun and toast it from the inside. Then they put condiments like onions, pineapple relish and mustard down in the hole and push the hotdog down in to the hole, too.. Vuela....a PukaDog. They are quite filling and totally Hawaiian. We first started going to Hawaii back in the mid 80's. Honolulu was kind of quite downtown and things pretty much closed down after 9 pm. Now it's more like a trip to Las Vegas. This is a shot of one of the more recently completed shopping areas on a street that runs south of Kalakaua Ave. It is a two story affair that is open well into the night. Left to right is Mike Nassir, Mary Kado'oka, Connie and Donn and what has become a traditional Waikiki dinner among great friends. This time at Sam Choy's, under the Nimitz Highway near the airport in Honolulu. 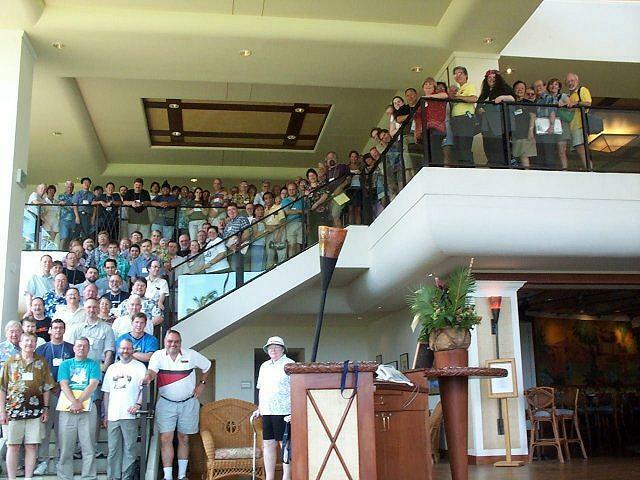 One of the reasons for the Hawaii trip was to present a short workshop to a small group of amateur astronomers on Maui. The workshop was "instigated" by Mary. She is a Research/Education Specialist at the University of Hawaii Institute for Astronomy [UofA IfA]. 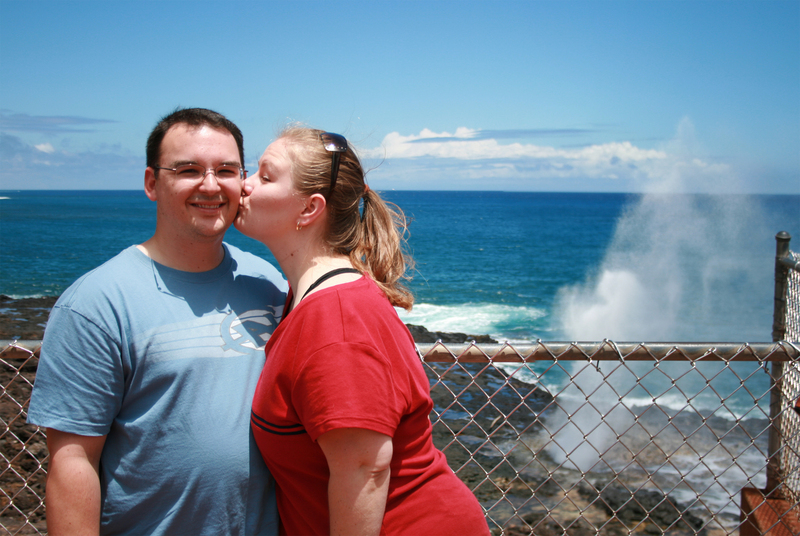 She and Mike are both astronomers, and they use astronomy to teach math and physic concepts to college bound high school students during a two week summer workshop called HI-STAR (Hawaii Student/Teacher Astronomy Research) at the Univ, of Hawaii. As part of the course, Mary and Mike allow the HI-STAR students use my Indiana observatory by remote control over the internet. Since it is dark here in Indiana when it is still mid afternoon in Hawaii, this works out well for the classes. The students take images of stars and galaxies as part of the course and then download the images over the internet to their computers back in Oahu. Mike works one-on-one with the HI-Star students and also is an astronomy instructor at the UofH. One of Mikes many accomplishments was a stint on the game show Jeopardy in 2004. Mary suffers from an "excess of personality". She has enough at least two people...maybe three! She exudes enthusiasm, which is what makes her such a successful instructor and organizer. She gets people to "want" to work for her causes. You don't learn how to do that talent...you are born with it. At the risk of making a fauxpaux, Mary's personality is very much typical in Hawaii for her generation. The people are friendly by nature and you have to like them. That same personality may not be quite so common in the younger Hawaiian generation, probably because they have had too much western influence. Here is a group shot of some of the kids from the 2008 HI-STAR graduating students. This is my CCD Photometry workshop at the new University of Hawaii Institute for Astronomy building on Maui. It is a beautiful and modern building with laboratories that service the observatories a short distance away on Mt. Haleakala. I think that we were the first group to ever use this room. If you notice, I am giving a presentation wearing shorts and a Hawaiian shirt. How great is that? This is me and Dr. John "JD" Armstrong. JD put together the CCD workshop. He is a recent PhD graduate in astronomy from the UofH and is a specialist in solar astronomy. JD is also in charge of outreach for the IfA on Maui so he interfaces a lot with high school students and the local media. JD had learned that I had just completed my Masters in Astronomy but I was unable to attend the actual graduation in Melbourne, Australia. So, over the workshop lunch break, he arranged for a "mock" graduation ceremony. JD donned his own robe and cowl, and, with a laptop computer blaring out "Pomp and Circumstance", I was presented a Kukui nut lei that is the traditional gift for men when graduating in Hawaii. I learned later that this particular lei is the same one that JD received for his PhD graduation, so it really meant a lot to me. Oldest son, Jason and his wife Jamie at the Luau on Kauai. We had three groups of visitors over the three weeks we were on Kauai. And we took each of them separately to the Luau at the Princeville Hotel. By the third week, the hotel personnel knew us on site. By the way; nine months after their visit to Hawaii, they blessed us with our first grandchild, Abigail. This tidal pool just off Hanalei bay is a favorite of the local kids. I had though about jumping in too, until I noticed that the rocks on the sides of the pool are like razors and one must "time" the surf in order to get enough height to reach the high rocks and pull oneself out. Middle and youngest sons, Tyler and Aaron before the Luau at the Princeville Hotel. By now, the entertainers at the luau knew us. Connie arranged for Aaron to be an on-stage "dance victim" that evening.